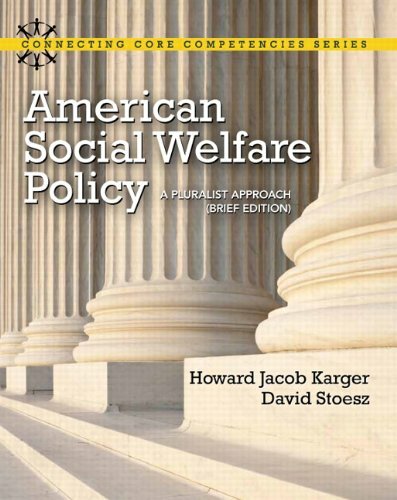 Provides a balanced and comprehensive overview of social welfare policy in the United States. This text is part of the Connecting Core Competencies Series. American Social Welfare Policy: A Pluralist Approach, Brief Edition examines social welfare policy in the United States, and includes cutting-edge issues such as information on the 2008 presidential election, the economy, the housing bust, the passage of Proposition 8 in California, and much more. Teaching & Learning Experience Improve Critical Thinking – Helps students sort out the major institutional actors within social welfare policy. Engage Students – Offers a user-friendly framework for policy analysis. Explore Current Issues – Information on Social Welfare Policy. the 2008 Election. Proposition 8. Economic issues. Apply CSWE Core Competencies – The text integrates the 2008 CSWE EPAS, with critical thinking questions and practice tests to assess student understanding and development of competency. Support Instructors – An Instructor’s Manual and Test Bank, Computerized Test Bank (MyTest), BlackBoard Test Item File, and PowerPoint presentations are included in the outstanding supplements package.